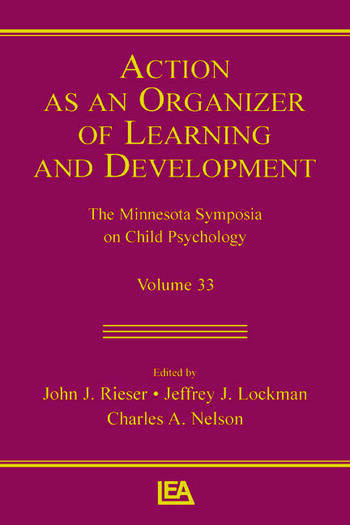 This is the 33rd volume in the Minnesota Symposium on Child Psychology held in October 2002. The symposium was held to honor the scientific and mentoring contributions of Anne Danielson Pick and Herbert L. Pick, Jr.--two longtime and beloved professors of the Institute of Child Development. It focused on "Action as an Organizer of Learning and Development" and integrated the best and most innovative research on the role of action in perceiving and understanding. Taken together, the book captures the intellectual excitement that characterized the 33rd symposium and appeals to developmental psychologists, particularly those interested in perceptual development. Contents: Preface. Part I: Using Information to Guide Action. D.N. Lee, Tau in Action and Development. C. von Hofsten, The Development of Prospective Control in Tracking a Moving Object. K.E. Adolph, Learning to Learn in the Development of Action. W.H. Warren, Information, Representation, and Dynamics: A Discussion of the Chapters by Lee, von Hofsten, and Adolph. Part II: Computational Complexity and the Integration of Information. R.N. Aslin, Object Information, Computation Complexity, and Constraints on Action. M.S. Banks, The Benefits and Costs of Combining Information Between and Within Senses. E.W. Bushnell, Stats Modules for Babies! Computing Conditional Probabilities and Weighted Variance With Rapid Sampling: A Discussion of the Chapters by Aslin and Banks. Part III: Active Learning During Early Development. N.S. Newcombe, Evidence for and Against a Geometric Module: The Roles of Language and Action. E. Thelen, V. Whitmyer II, Using Dynamic Field Theory to Conceptualize the Interface of Perception, Cognition, and Action. B.I. Bertenthal, Theory, Methods, and Models: A Discussion of the Chapters by Newcombe, and Thelen and Whitmyer. Part IV: Using Representations to Guide Action. R. Keen, Using Perceptual Representations to Guide Reaching and Looking. L.S. Liben, The Role of Action in Understanding and Using Environmental Place Representations. J. Huttenlocher, Mental Representations as Explanatory Constructs: A Discussion of the Chapters by Keen and Liben.